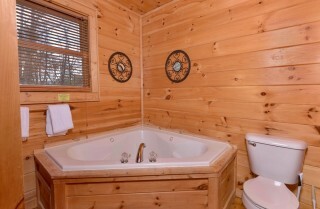 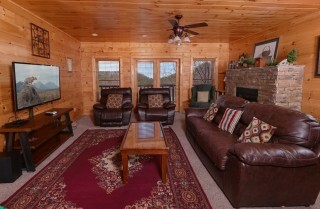 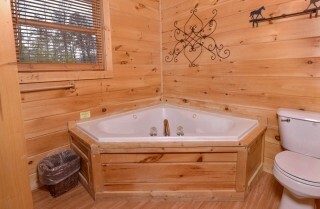 Large groups looking for a cozy cabin with a convenient location, don’t miss the pet-friendly Jennie’s View! 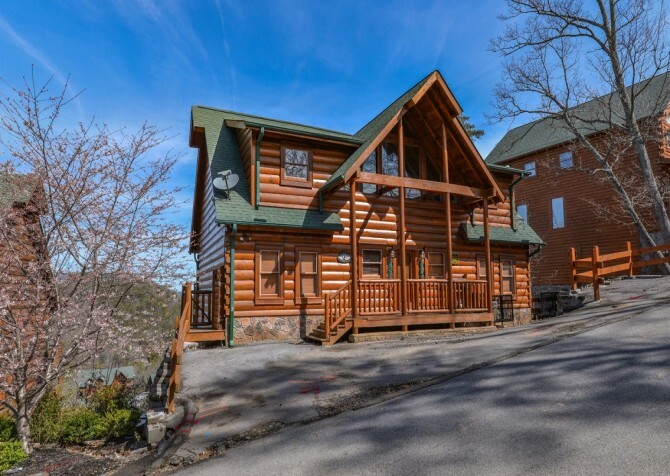 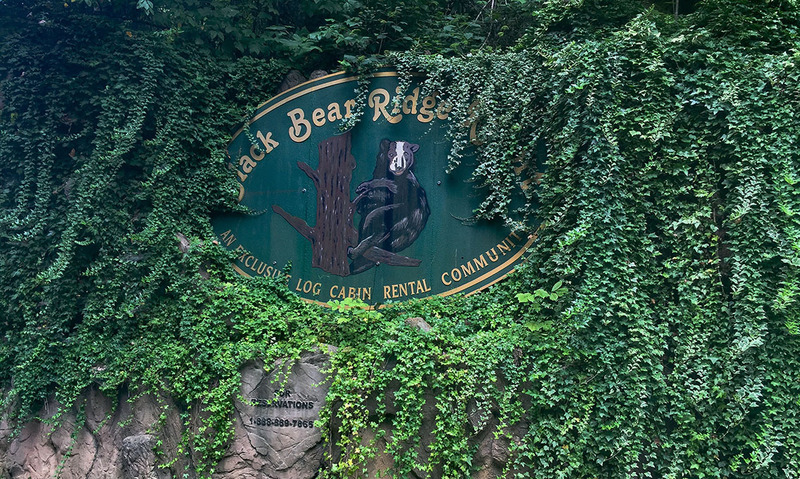 Nestled in the valley inside the Black Bear Ridge Resort, Jennie’s View offers a short drive to downtown Pigeon Forge, beautiful views of the rolling Smoky Mountains, and plenty of space for a group. 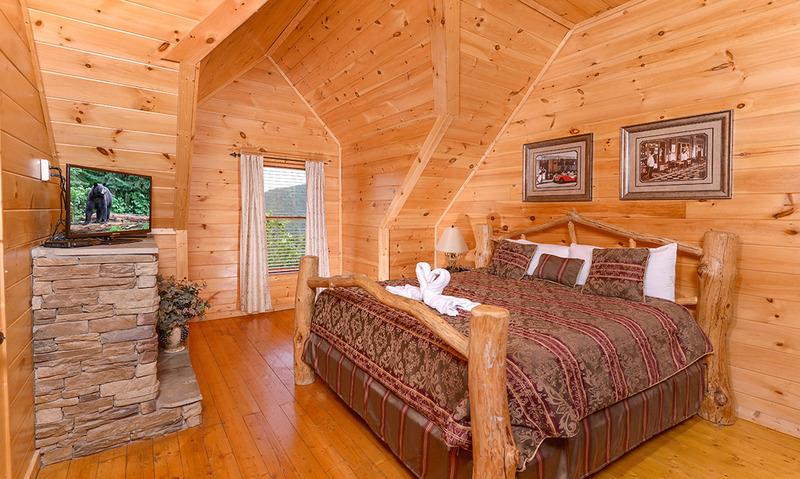 You can fit 22 guests inside this cabin’s 4,000 square feet of space, and with its 8 bedrooms and 6 bathrooms, everyone is sure to sleep comfortably. 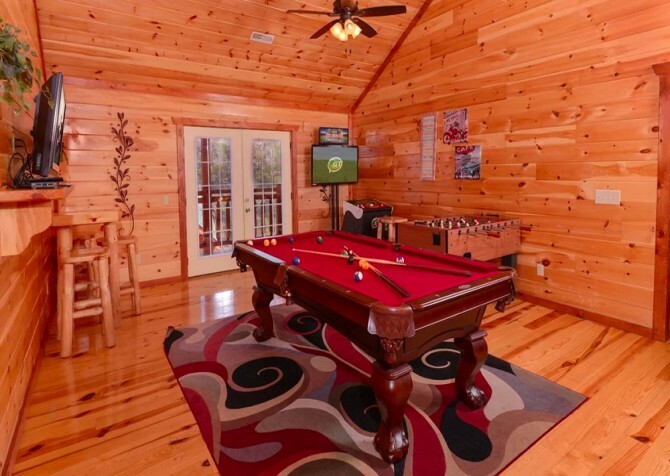 Bring the entire family, your wedding party, or large group of friends to enjoy a fully loaded game room with pool and foosball tables, community pool access, a media room with a big screen TV and Blu-ray player, and a rocking chair porch with impressive mountain views. 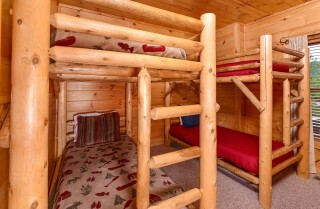 This cabin also provides convenient amenities like a charcoal grill, an electric fireplace, a washer and dryer, and a flat, paved driveway with room for 5-plus cars. 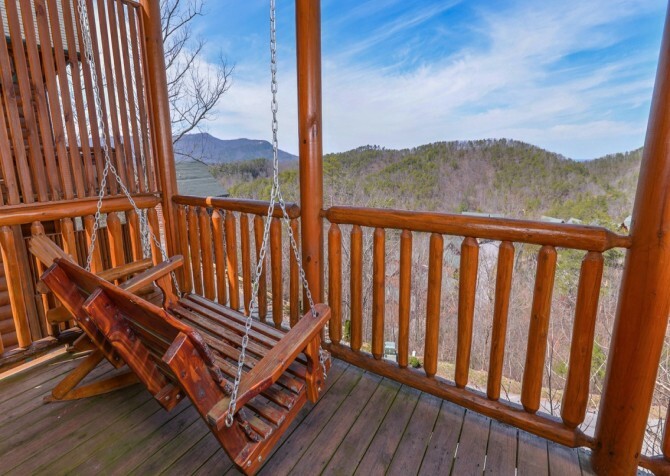 For plenty of space, unforgettable views, a prime location, and tons of entertaining options, Jennie’s View is the Pigeon Forge rental for you! 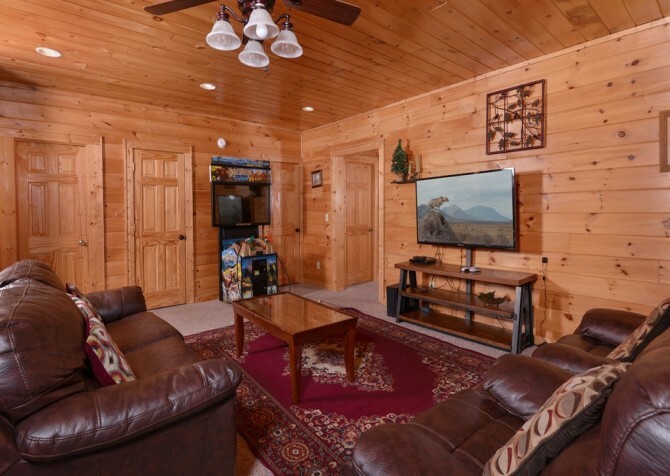 Whatever your group’s reason for visiting the Smokies, you’ll be looking for a cozy space where everyone can get together to play games, meet and greet, or relax after a long day of exploring downtown Pigeon Forge. The Jennie’s View living room is a great space for all 3, thanks to its huge leather sectional and cozy recliner. 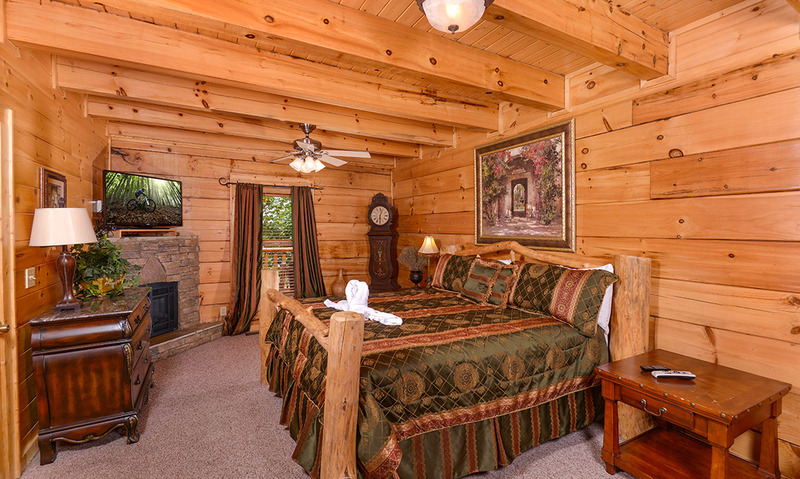 This room also provides a round table for 2 in the corner—the perfect place for a cup of coffee in the mornings or a glass of Smoky Mountain wine in the evenings. During the day, soak up the Smoky Mountain sunshine from the wall of large windows across the back of this space. And when you return from your downtown group activities each evening, turn on the big screen TV mounted above the electric fireplace for a quiet evening before the fire. You’re sure to love this living room for its size, coziness, and versatility! Cooking for a large group can be intimidating, but not when you have access to the large, updated kitchen inside Jennie’s View. 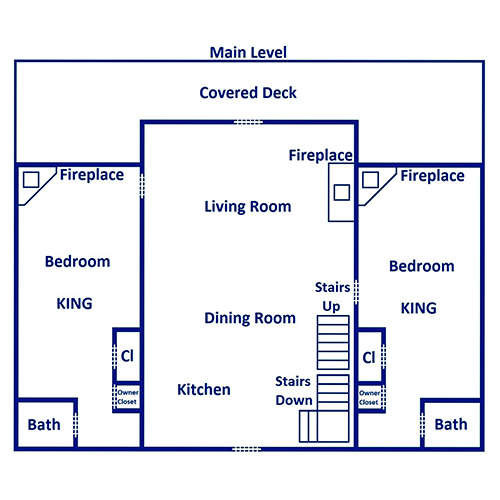 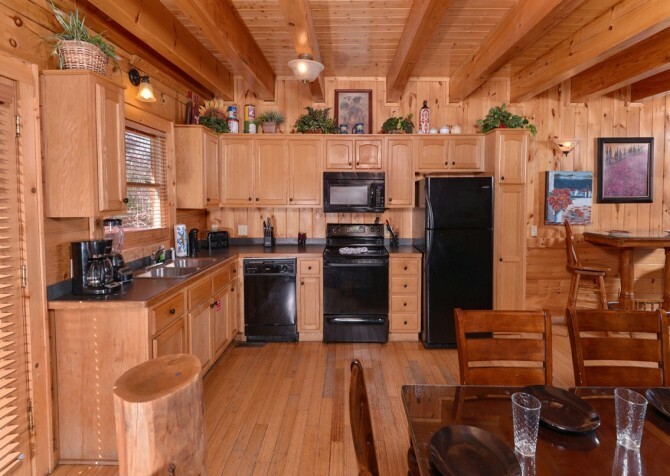 This L-shaped kitchen is open to the main floor of the cabin and provides all your major appliances in black, including a full-size refrigerator, electric stove and oven, over-the-range microwave, and dishwasher. You’ll also find countertop essentials like a knife set, coffeemaker, blender, toaster, and electric can opener inside Jennie’s View. For everything from a fresh cup of coffee to a homemade turkey dinner on Thanksgiving, you’ll find what you need inside this large group cabin’s kitchen! 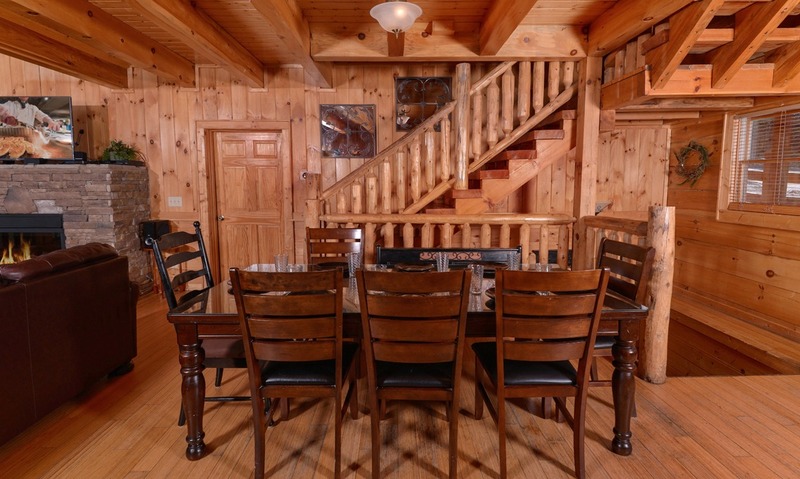 And don’t forget that many Pigeon Forge restaurants provide catering and delivery options if you’re looking for a way to eat in the comfort and privacy of your cabin without all the fuss! 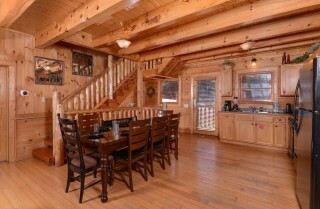 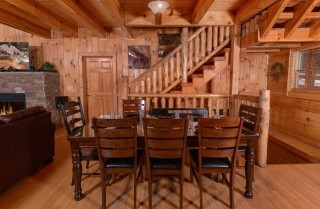 If you’ve found the Jennie’s View kitchen, you’re only steps away from this cabin’s dining room. A coffee-brown table with place settings for 8 will seat a good portion of your group, but feel free to spread out to the open-concept living room, where you’ll find additional tables for 2 and a large sectional. 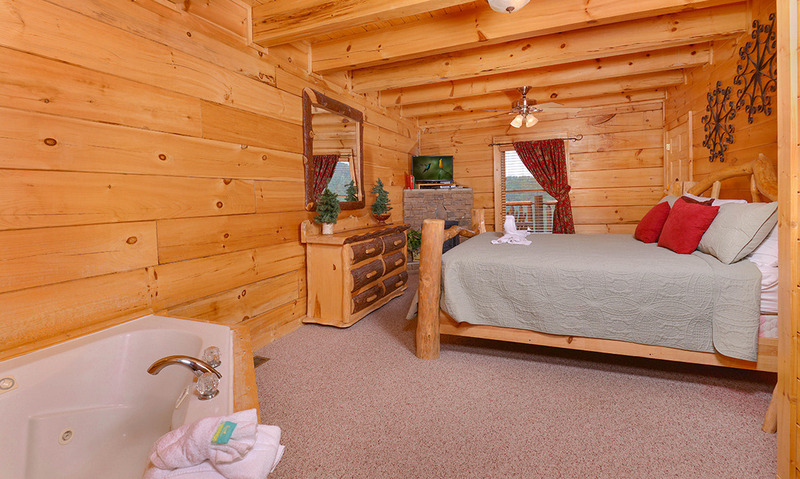 You won’t find better views for your Pigeon Forge dining experience than the dining room inside Jennie’s View! 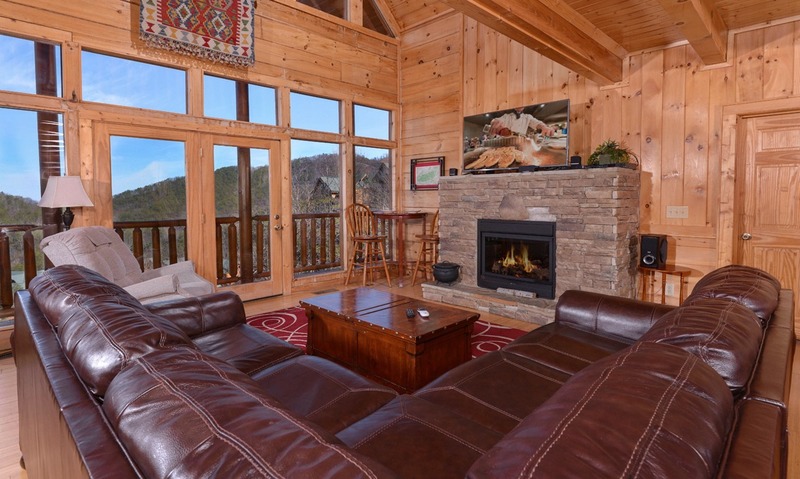 The wall of windows across the back of the living room flood this space with natural light and provide stunning Smoky Mountain views for the perfect backdrop to a delicious homemade meal. 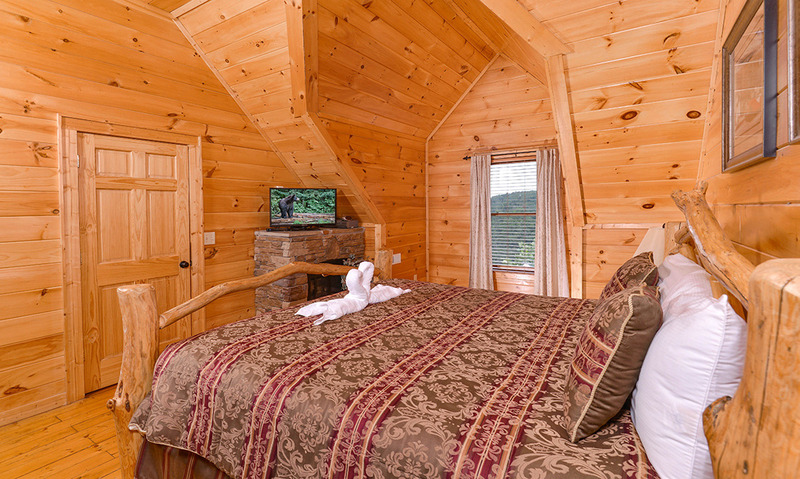 If it’s a rainy day in the Smokies, head upstairs for an afternoon of fun inside the Jennie’s View game room! 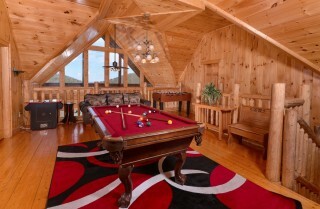 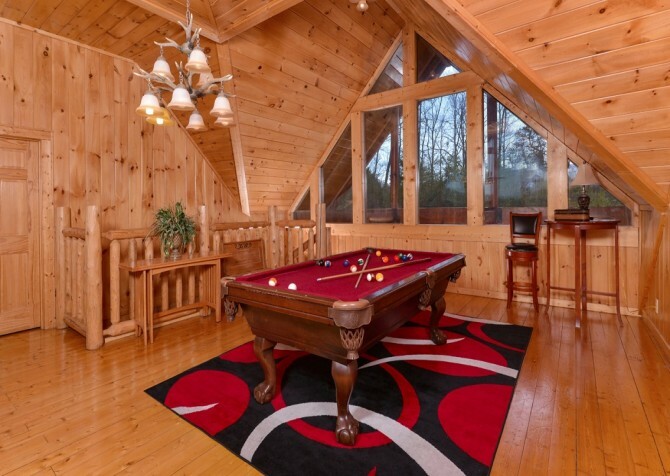 Located in the loft, this game room comes fully loaded with a pool table, foosball table, and multigame arcade. You’ll also find a cozy couch, where you can relax between shots at the pool table. 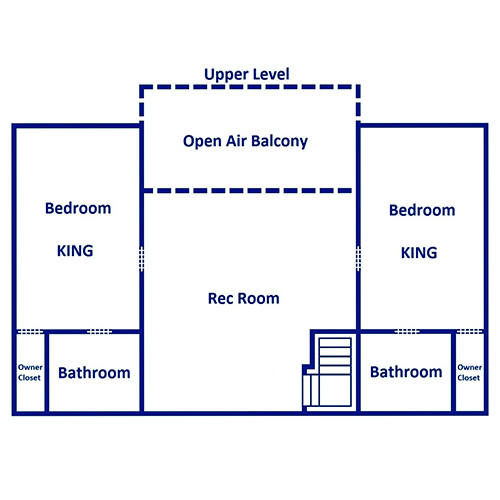 Large windows across from the balcony, offering Smoky Mountain views. 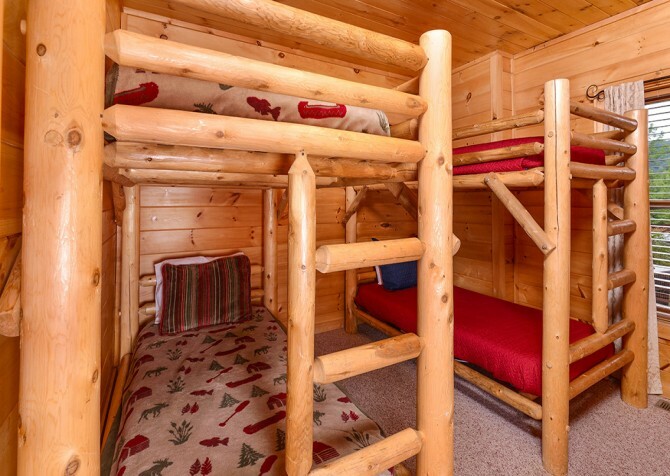 A visit to Smoky Mountain attractions like Fort Fun is a great option for getting your group out to play, but when you stay at cabins like Jennie’s View, you’ll have entertaining options galore without ever leaving the driveway! Another favorite space for rainy day fun is the media room inside Jennie’s View. Enjoy a big screen TV, Blu-ray player, and DVD player inside this cabin. 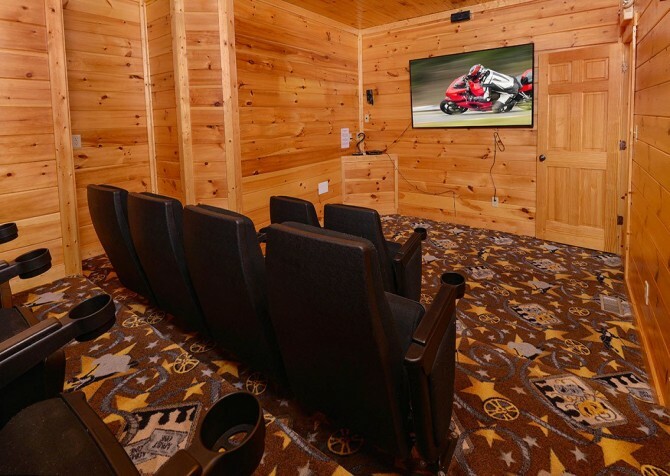 All you need to bring is popcorn and your favorite mix of DVDs! 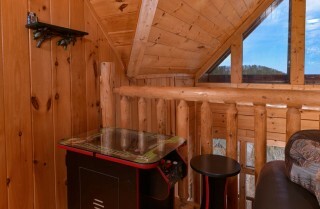 This media room also features a Big Buck Hunter arcade game. 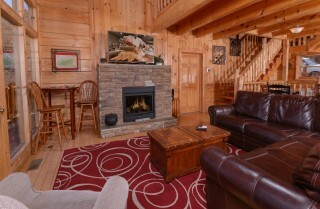 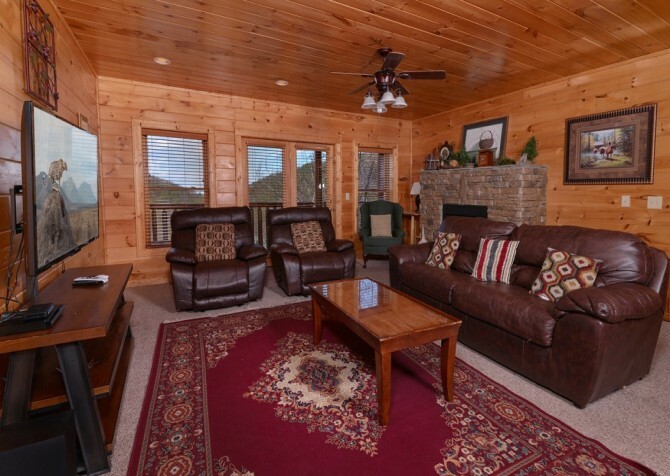 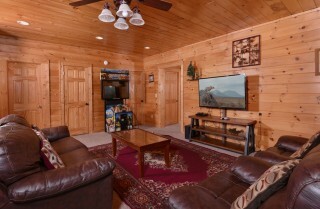 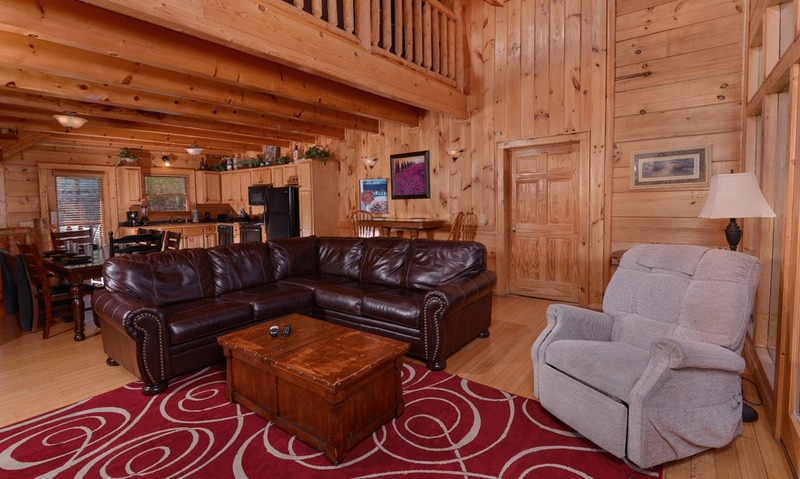 Besides all this, the Jennie’s View media room provides a full-size leather couch and 2 leather recliners along with a plush sitting chair, a stone fireplace, and French doors that lead directly to one of several deck levels offered by this Pigeon Forge rental. A family reunion or any other large group gathering needs plenty of space and plenty of bedrooms so all your guests can sleep comfortably. 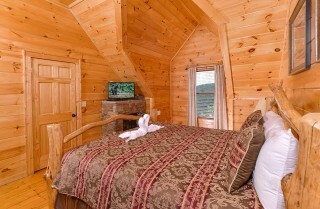 That’s why Jennie’s View offers 8 bedrooms and 6 bathrooms, providing cozy sleeping accommodations for 22. 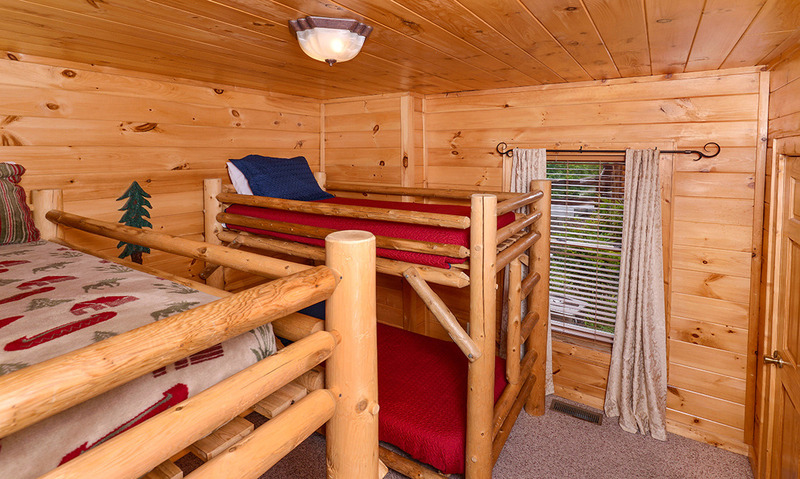 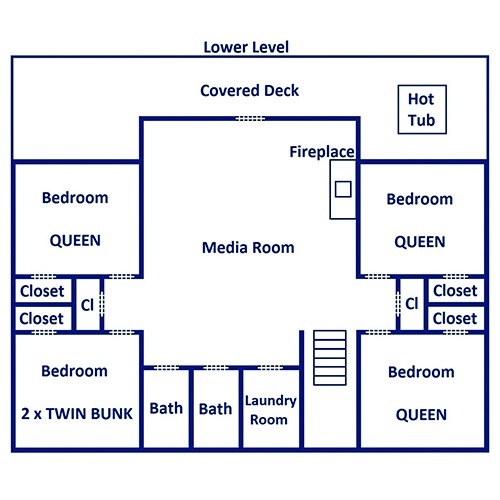 Inside the bedrooms, enjoy a mix of 4 king-size beds, 3 queen-size beds and 2 twin bunks. 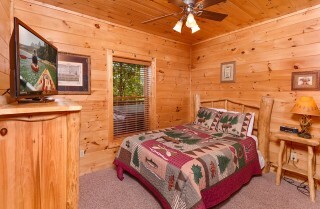 You’ll also find 2 sleeper sofas inside Jennie’s View. 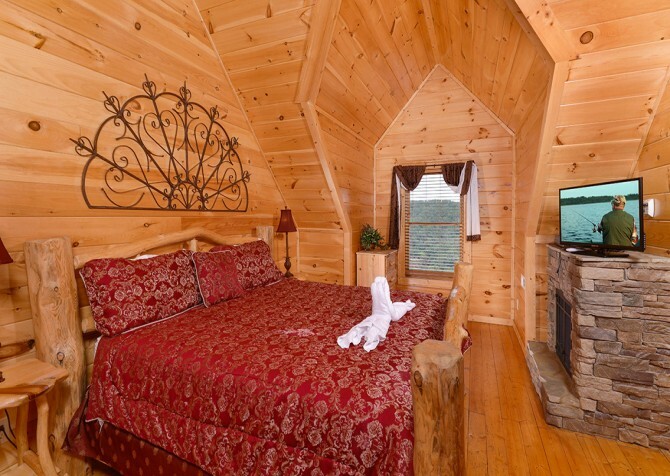 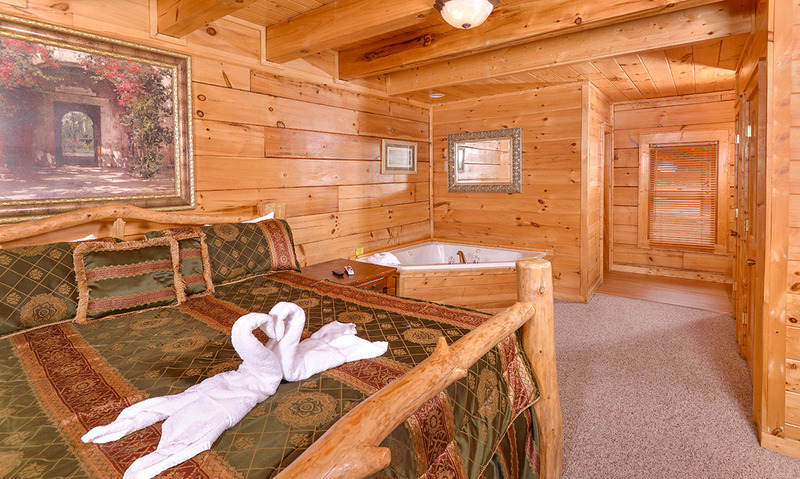 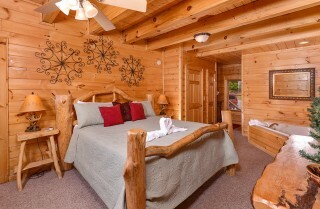 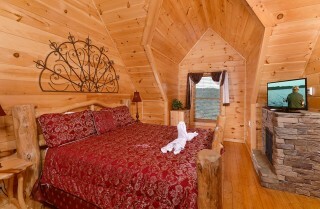 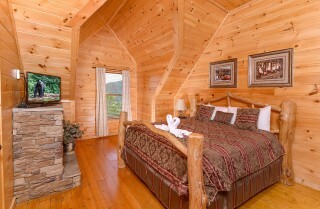 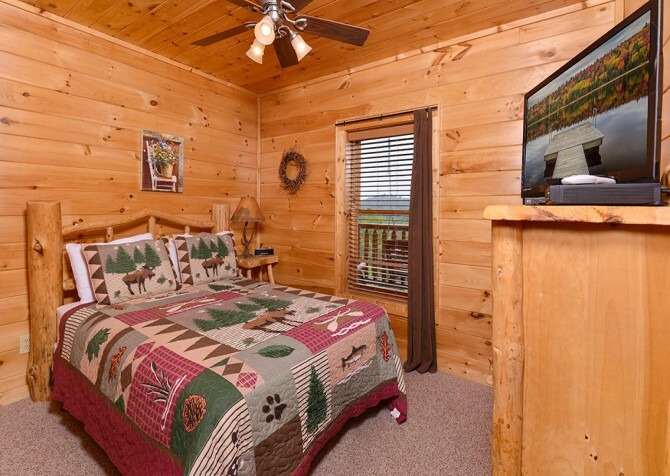 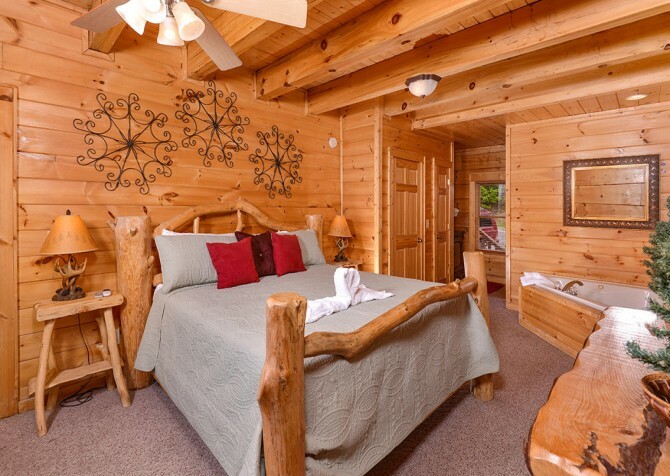 Each bedroom comes with cozy log-style furnishings and little extras like reading lamps and night tables. Some bedrooms even come with personal touches like a fireplace and an indoor jetted tub. Be sure to get there early so you can pick out your favorite bedroom inside Jennie’s View! One of the highlights to any Pigeon Forge vacation is soaking up unforgettable Smoky Mountain views. 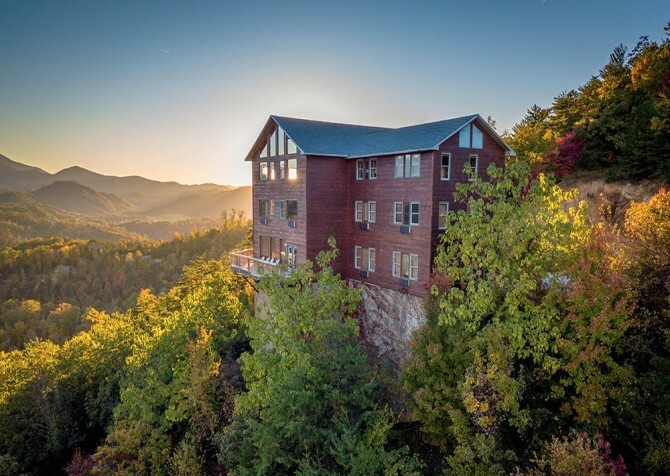 Jennie’s View makes that a reality with its multiple porches with direct views of the rolling hills and tree-studded mountainsides of the Smokies. 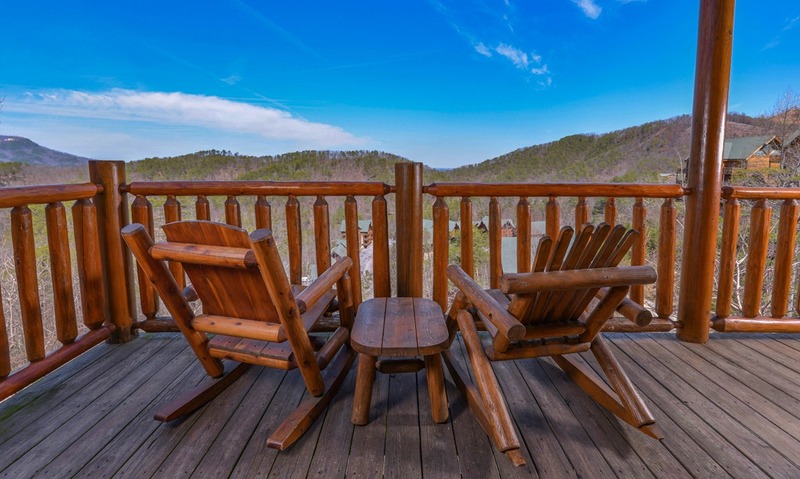 In September and October, enjoy the rich colors of the fall foliage, and in the spring, enjoy cool mountain mornings on your rocking chair porch. 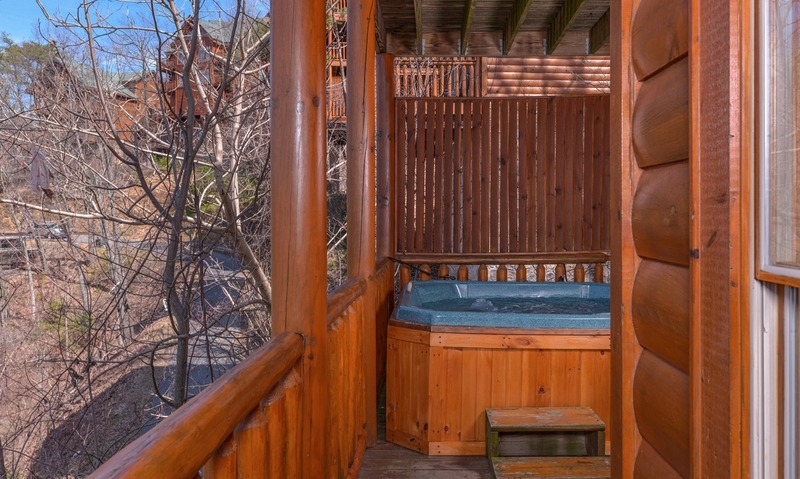 Fix a glass of a Southern staple—sweet iced tea or Smoky Mountain ‘shine—and soak up the views from multiple angles, or change into your swimsuit and gaze at the stars while you soak in this cabin’s outdoor hot tub with a privacy screen. All this and more is possible thanks to the great outdoor spaces at Jennie’s View! 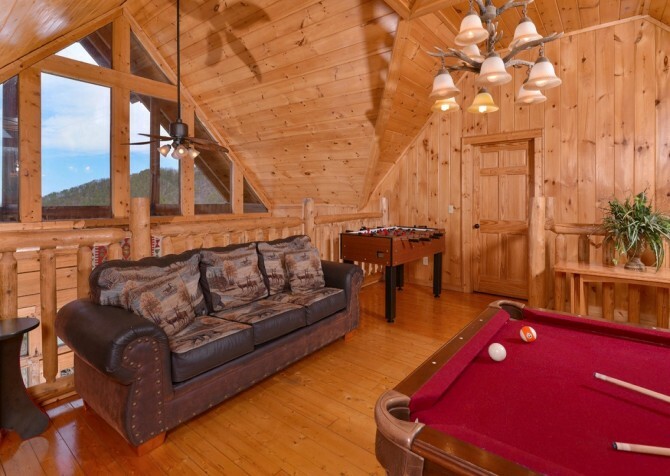 Game tables, media devices, mountain views—these aren’t the only amenities you’ll find at Jennie’s View. This 4,000-square-foot cabin also provides convenient amenities like wireless internet access, a washer and dryer, and a charcoal grill. 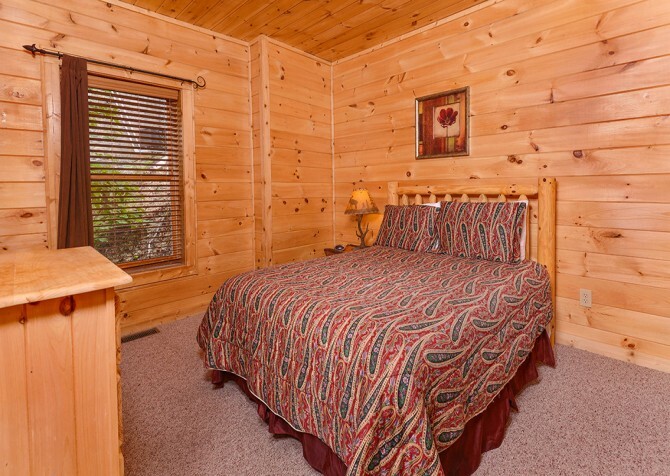 Plus, this cabin’s flat, paved driveway (with overflow parking across the street) provides room for your group to park 5+ cars during your stay. 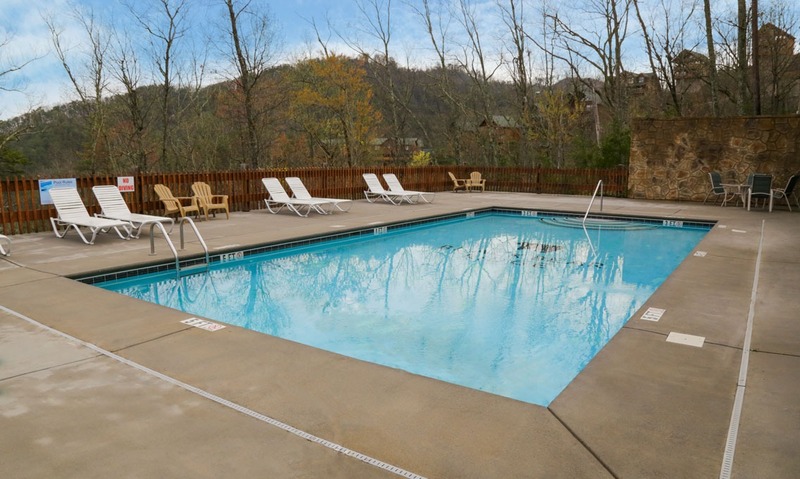 A spot in the Black Bear Ridge Resort also means you’ll have community pool access! 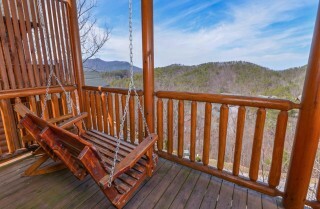 What better way to make memories as a group than with a visit to Wears Valley Zipline Adventures in Sevierville? 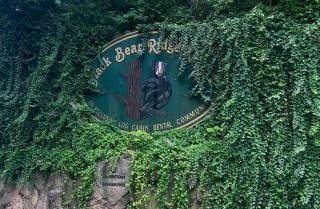 Ride nearly 2 miles of ziplines at this popular outdoor attraction! 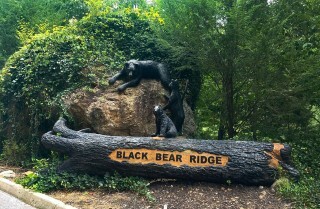 Get a close-up view of the Smokies on the Smoky Mountain Alpine Coaster located in Pigeon Forge. 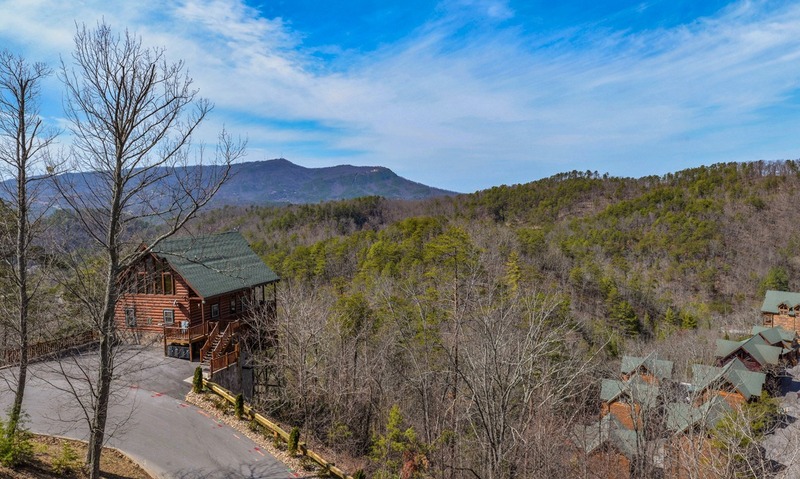 You control the speed at this attraction, which boasts the longest downhill track in the U.S.! 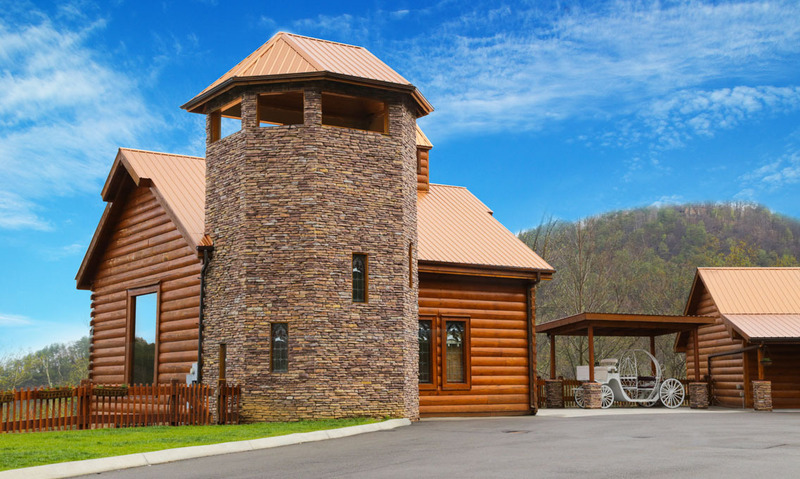 Indoors and outdoors, LazerPort Fun Center has something for everyone in Pigeon Forge! Enjoy go-karts, mini golf, laser tag, and the Smoky Mountain’s largest arcade! "We held a surprise 50th birthday party for my wife and we had and awesome time. 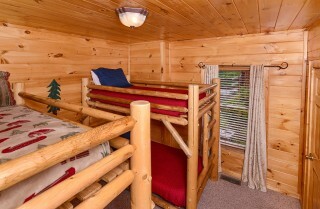 We had a total of 21 people In Jennie's View cabin, and we had plenty of room and lots of fun....we will be back!"